Melissa Easterling of Easterling Events offers a Baltimore Wedding Planning service. 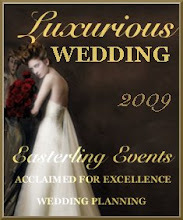 Easterling Events conducts wedding planning workshops for brides planning their own wedding and for those interested in starting a wedding planning business. Happy Summer from Easterling Events! Things have been crazy as of late, but we are sooooo excited about some BIG changes that lie ahead in 2017-2018! Looking forward to sharing soon. Tina Turner's Wedding - Beautiful !!! Baltimore Event Planner, Melissa Easterling, conducts wedding planning seminars throughout the Baltimore area for brides who are planning their own wedding and for those interested in establishing a career in wedding planning. 'Wedding Planning Essentials' workshops above. For Class Locations, Time & Dates.